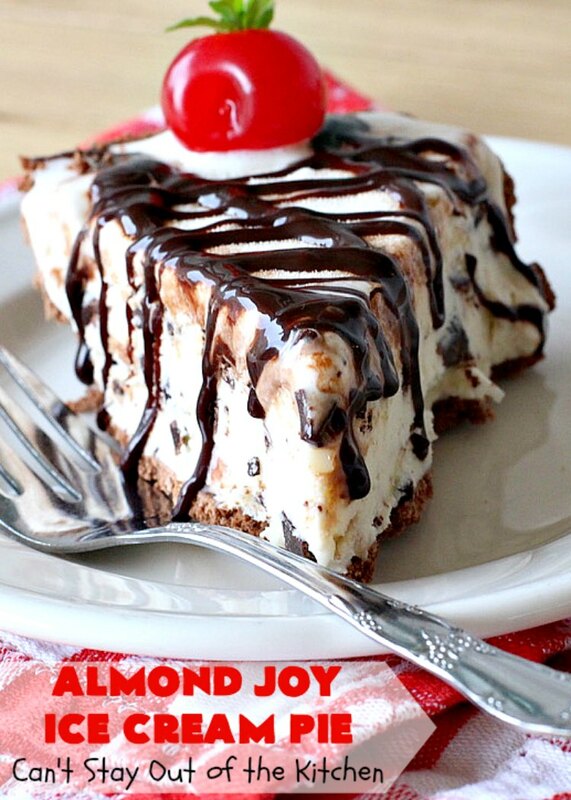 Almond Joy Ice Cream Pie is extraordinary! This spectacular ice cream pie is like eating Almond Joy Bars but in ice cream form! This is an incredibly easy 4-ingredient recipe. ANYONE can make this easy recipe, including young children. It’s that easy. 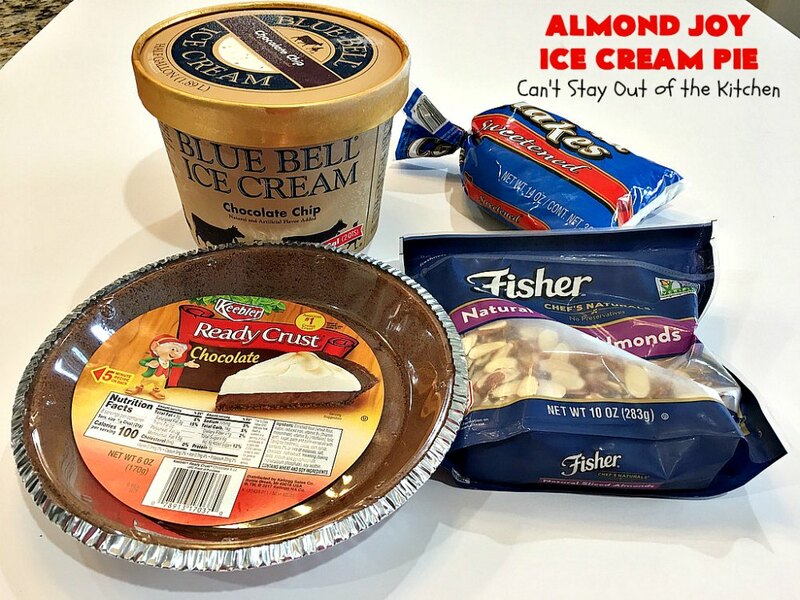 I used a chocolate crust, Blue Bell chocolate chip ice cream, coconut and sliced almonds. That’s all. Easy, check. Delicious, check. Decadent, check. 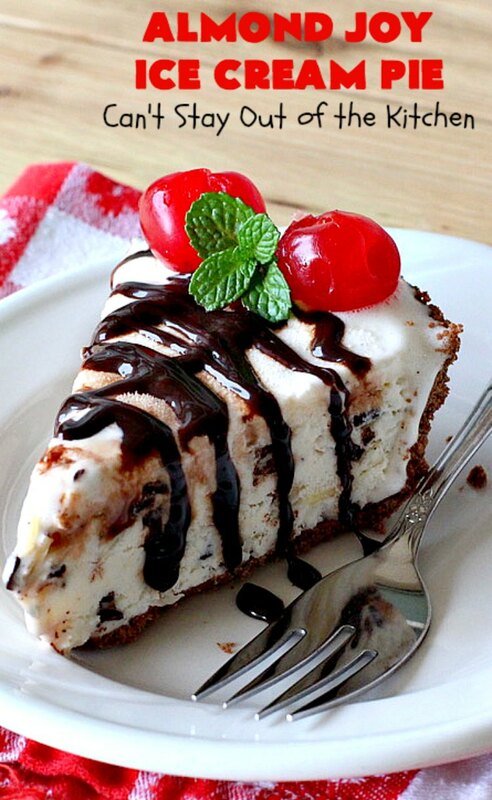 A dessert to die for, check, check check! To make this recipe you first soften the ice cream. I think I had the container out on my counter about 15-20 minutes before it was soft enough to start stirring. Add almonds and coconut. Stir everything together. Then pile the ice cream mixture into the chocolate pie shell. Freeze, then serve. That’s easy, easy, E-A-S-Y! The nice thing about this dessert is it’s elegant and festive for any holiday. 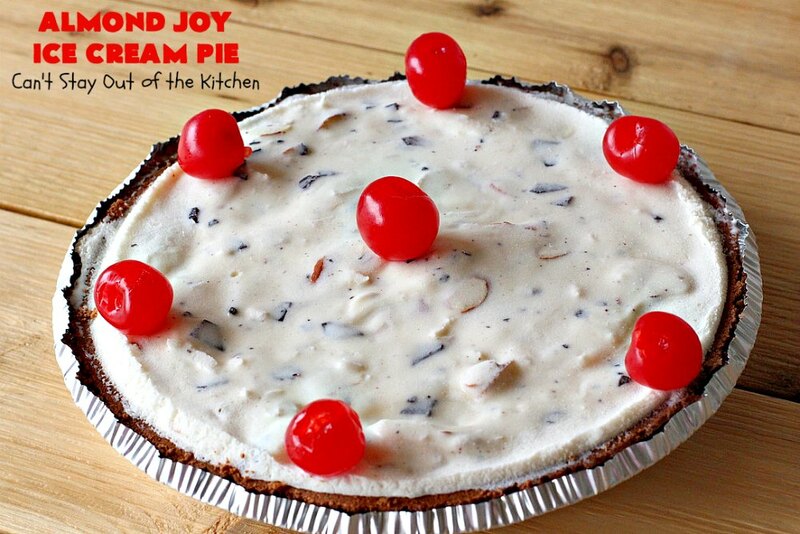 Almond Joy Ice Cream Pie is terrific for holidays like Easter, Mother’s Day or Father’s Day. But it’s also wonderful for other holidays and special occasions like Valentine’s Day or Christmas. Having a dessert that includes only 4 ingredients and takes about 5 minutes to make is also a big plus! I added chocolate sauce and maraschino cherries for decoration. But you don’t have to unless you want to be fancy. 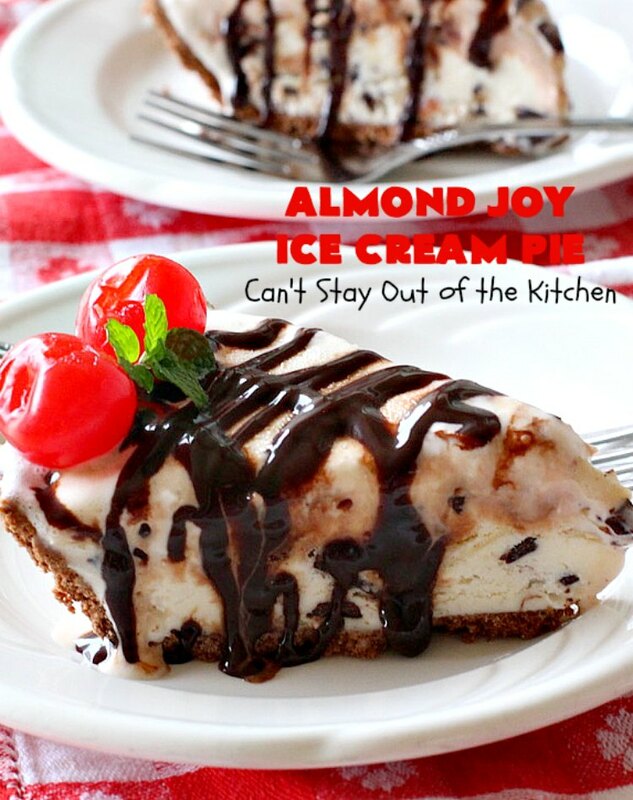 Almond Joy Ice Cream Pie is the ultimate in a dessert experience. 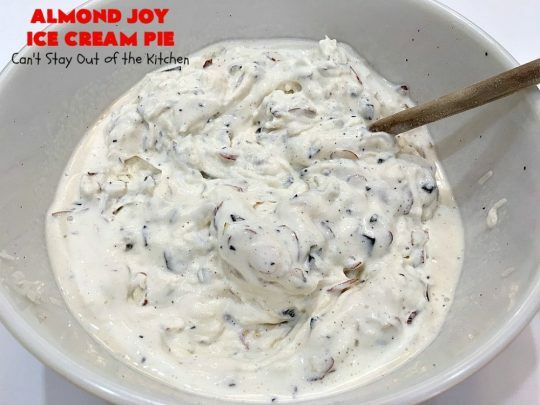 It is so good you will find yourself cleaned out of pie in no time. The ingredients actually fit in two chocolate pie crusts. So make one for now and freeze one for later! Almond Joy Ice Cream Pie is sensational! This four-ingredient recipe is so easy even little children can make it! Every bite of this chocolaty dessert will have you drooling! Soften chocolate chip ice cream in a mixing bowl. It may take 15-20 minutes to get it soft enough to stir. 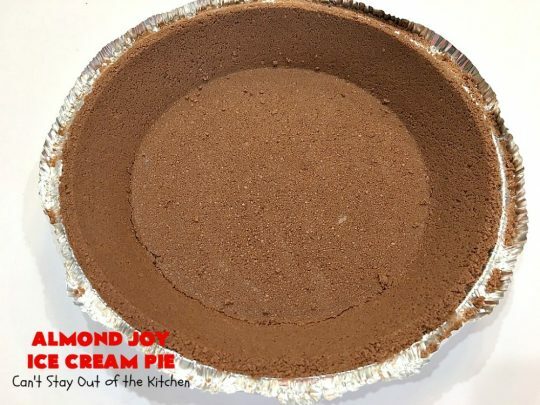 Set out chocolate pie crust. 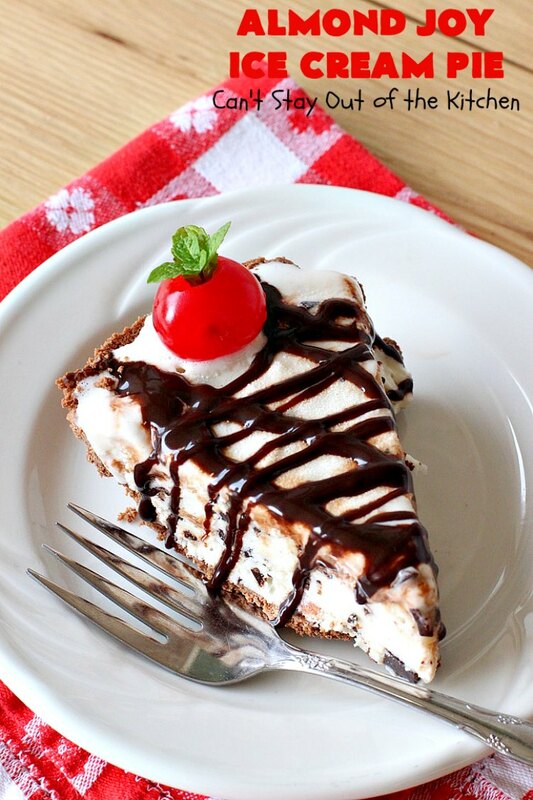 Pour ice cream filling into chocolate crust. (The filling is enough for two chocolate pie crusts). 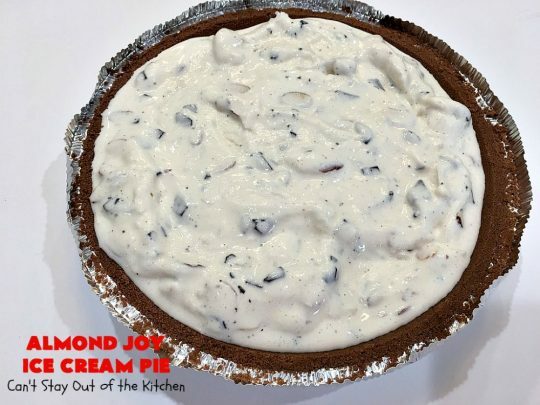 Freeze pie several hours until ready to serve. 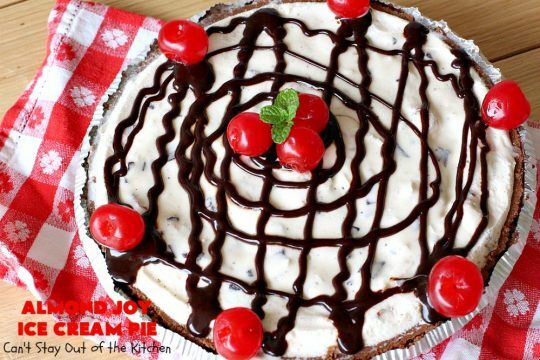 If desired, you can drizzle chocolate sauce over top of the pie and garnish with maraschino cherries. If you enjoy Almond Joy Bars, you’ll love this dessert. 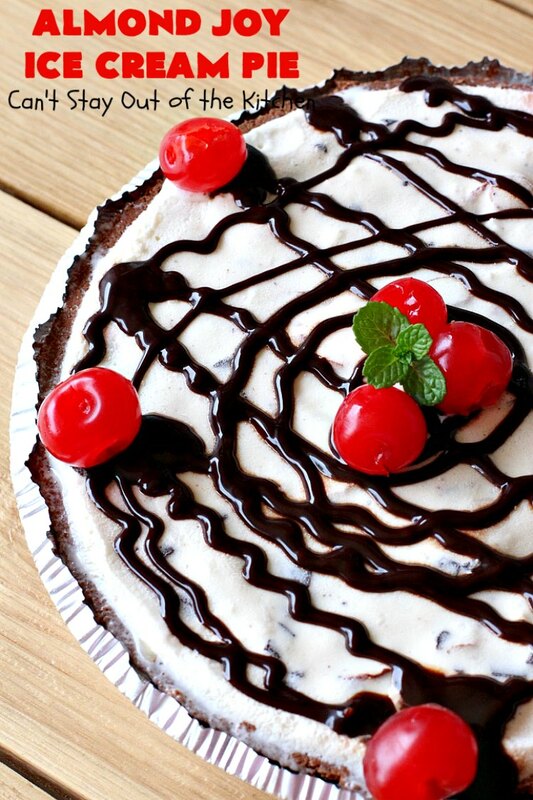 Drizzling chocolate sauce over the top adds delightful chocolaty flavor. Almond Joy Ice Cream Pie is a delicious dessert for Valentine’s Day, special occasions or parties. 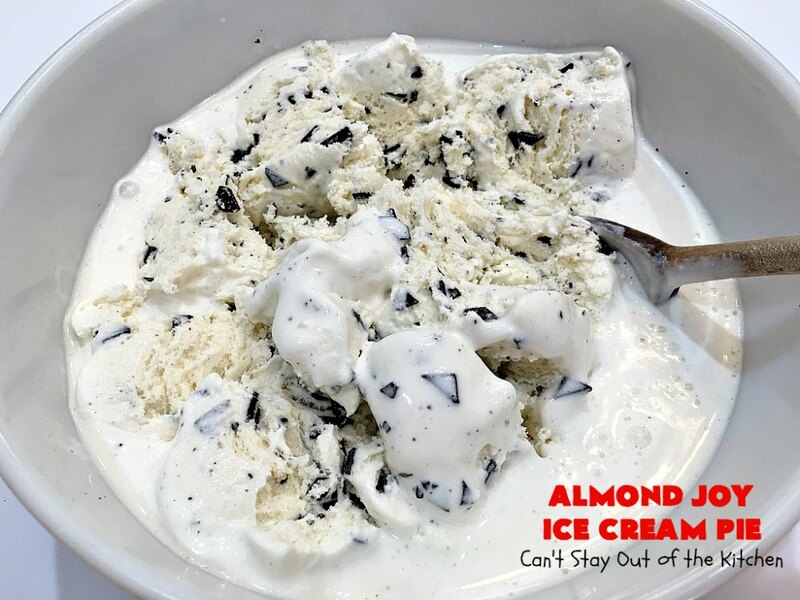 This spectacular ice cream dessert tastes like eating Almond Joy Bars but in ice cream form! 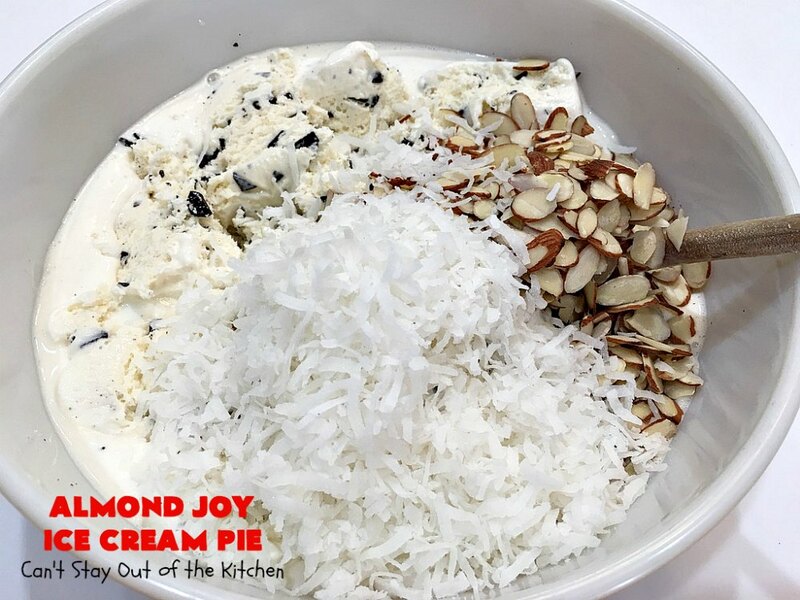 It's filled with chocolate chip ice cream, coconut and almonds. Then the ice cream is poured into a chocolate crust. Garnish with chocolate sauce and maraschino cherries, if desired. This incredibly easy 4-ingredient recipe is perfect for Easter, Mother's Day, Valentine's Day or special occasions. Mix ice cream, almonds and coconut together. Divide between both pie shells and freeze. Can garnish with a sauce or maraschino cherries, if desired. NOTE: You can use any type of crust, and alternate almost any combination of ice cream and nuts. NOTE: The filling is enough for two chocolate pie shells. 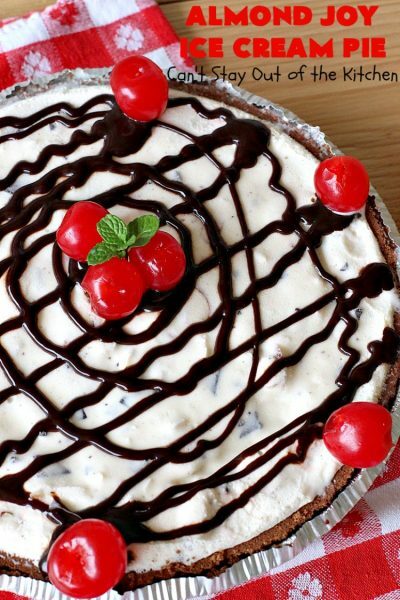 Almonds, coconut and chocolate make a dessert to die for! 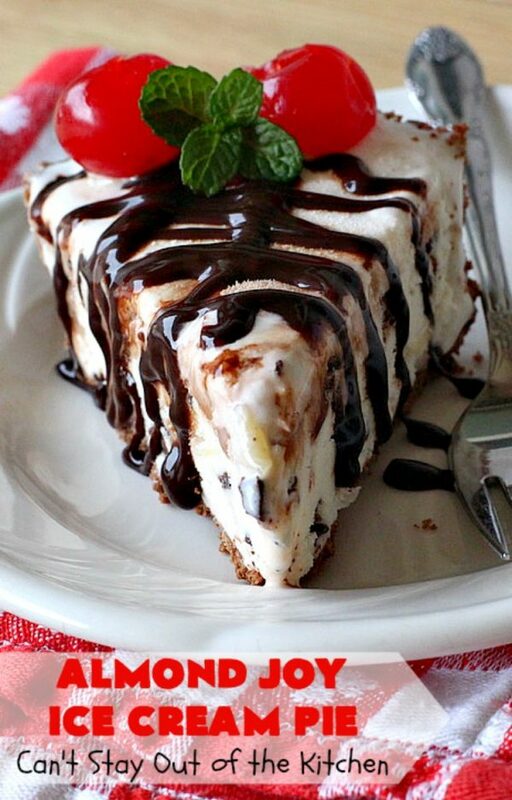 If you enjoy ice cream desserts, this one is scrumptious. 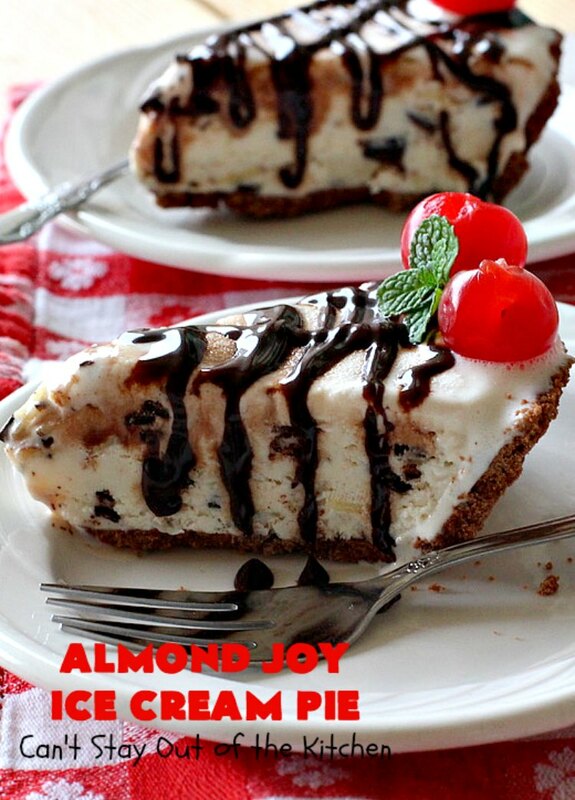 Almond Joy Ice Cream Pie will knock your socks off!